Have you ever felt the pain of losing valuable data that you can never replace (Family pictures, financial data, E-mails, etc.)? Are you an employer that needs your business related files backed up automatically, everyday, at a location other than your business premises, at a low price? 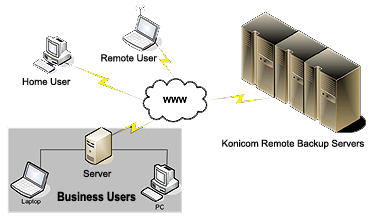 At Konicom, we offer remote data backup services to small businesses and individuals. With our remote data backup services you will never have to worry about losing your data again. Our data backup network is composed of a comprehensive, multi-level, multi-location backup process on RAID devices. All of our systems exceed industry standards in system security policies, guaranteeing your data integrity against all levels of failure. Our software allows you to back up your data automatically to our servers and receive email confirmation on a daily basis. The remote backup system is highly secured and no one (not even Konicom staff) can access your data except you. If you would like to hear more information on remote data backup, talk to our expert Bryan Wu at (916) 441-7373 ext 13 or send us an Email. Backs up changes within each file (In-file delta). Protects all desktops and notebooks easily. 1 Supported by AhsayOBM only. 2 AhsayACB runs on Windows and Mac OS X only. 3 Supported by Windows XP and Windows 2003 only. When you choose Konicom for secure remote data backup, you're ensuring the long term integrity of your data. The time and money spent to recover data from a crashed hard drive, accidental deletion, and even ransomware is something you should never have to go through. Our offsite backup is a solid investment in your business – with one low monthly fee you avoid the cost and hassle that comes with emergency data recovery. With Konicom's remote backup in place you'll have access to all your data when and where you want it. Signing up is easy- Click here to fill out the online application form or give us a call at 916-441-7373 and let Konicom's remote data backup experts protect your data today!